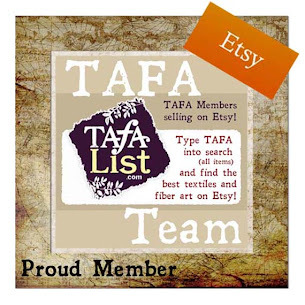 A 1200×300 banner on TAFA’s home page. Make your monthly payments easy by subscribing through PayPal. $100 will be deducted from your account automatically and you can discontinue your sponsorship at any time. Note: Only use this option if you commit to a minimum of three months. It is time consuming to set up the Sponsor Spotlights and we have also found that it takes repetition before you start seeing results. Your spotlight will show up in many places on the site and you will also be promoted on our Facebook page. You design fabric that is then produced commercially in a factory. Although your end-product might not be handmade, you are welcome to join as the designer. We are especially interested in products that are organic and environmentally friendly. You have a quilting shop with designer fabric made especially for quilters. You do not qualify for membership, unless you are also making quilts as a part of your business. The textile and fiber art industry is a multi-billion dollar engine in the United States alone. We appreciate all of the materials and support that the industrial side provides us, but TAFA is strictly about the creative and productive side of this industry. We will gladly use your sewing machines, batting, threads, and mills, but our aesthetic is as close down to earth as possible. Our members are mostly studio artists, but we also have teachers, publishers, other organizations, and small importers, all committed to the ethical pursuit of expression through the textile arts. As a gold sponsor, we will honor your part in this process and promote what you do, too. We do reserve the right to accept sponsorships only from those we feel share a similar commitment to our mission.